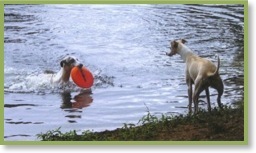 Welcome to our page dedicated to Meisterhaus Whippets. We fell in love with the Whippet breed a few years after our Basenji program began. Our commitment to produce happy, healthy and functional Whippets with sound temperaments has always been a priority. We feel just as strongly about maintaining the functional Whippet, as we do in the Basenji breed. We also feel strongly that Whippet type should never be compromised and must always be the priority. A Whippet should always be long and curvy with low and powerful movement. All of our Whippets are raised in our home and given daily personal attention until they go to their new homes. Though we have only bred a select few Meisterhaus Whippet litters, we are quite proud of our success. Our foundation Whippet, Ch. Ripshin’s Kissed By An Angel (Sara), was a Top 20 Whippet two years in a row and went on to be an ROMX producer. Sara produced many Meisterhaus Whippet champions and is in every Meisterhaus pedigree today. Sara’s daughter,Ch. Meisterhaus Goldie Hawnd, SC (Reese) has continued her Dam’s legacy by being one of the top producing Whippet dams of all time. Reese lives with our dear friends Chuck, Gail and Jenny Boyd (Ableaim Kennels) in Apex, North Carolina. We are so appreciative to the Boyds for all they have achieved and we are looking forward to many more future accolades in the years to come out of our baby girl, Reese. Another important person in our Whippet life is our dear friend Carol Schurman (Leprechaun Whippet Fame) who showed Madonna (Top 20, Ch. Meisterhaus Evita) and JuJu (Top 20, Ch. Meisterhaus Take A Bow). We also have several other alliances with dear friends, whom we have co-bred litters with including: the Boyds (Ableaim Kennels): Thomas Kirstein (Ripshin); Charlotte Lee (Charlamar); Linda Johnson (Barchet) and Linda Stewart (Endeavor). We hope that our love of this amazing breed shows in each Whippet born here at Meisterhaus.